Today was a quiet day. Everyone knew exactly what had to get done and got immediately to it. We have until Tuesday to finish everything, so if you know you are under 60% you have until then to catch up your hours. We have many people who have written that they want to try-out for the flight team. It’s time to practice for Saturday! We also picked our roommates for the New Orleans trip. There are four people to a room. Therefore if you have over 80% and have paid you need to contact a mentor tomorrow to tell them with whom you want to share a room. With that said, the second round of fees for the trip are soon due. Our next meeting is tomorrow February 17 from 6-10 pm. One more week!!! 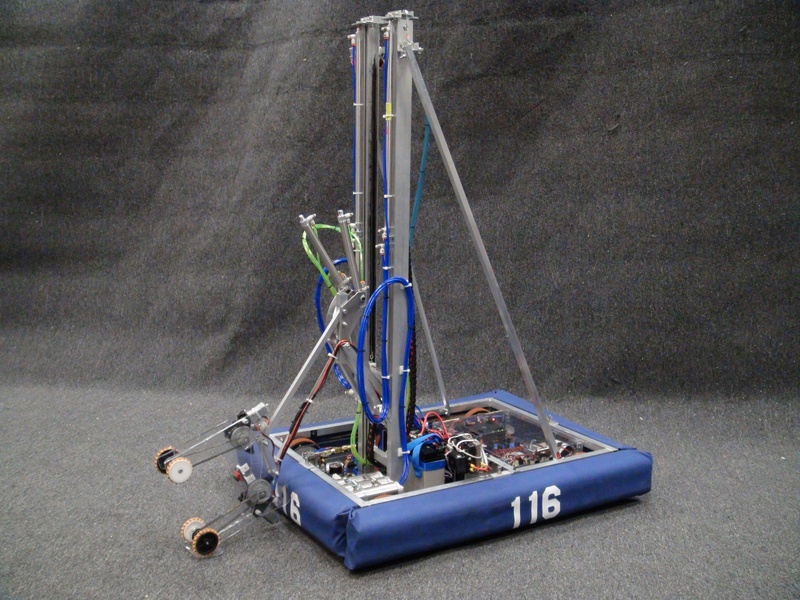 Things have sure come a long way since the beginning of build season and we are almost there. Please keep in mind that several subgroups are in need of some help. Make sure that if you are ever able to offer an extra hand, you talk with a sub team captain and ask if they need anything. Additionally, don’t forget about your hours!!! Without 60% of your hours you are not a member, and without 80% you cannot attend the trips. An email was sent out today with an updated version of everyone’s hours, so make sure there are no errors in your records. Things are really starting to come together now, but we’re going to need the entire team working as hard as they can to be successful at the competitions. While still behind schedule, the team is making a tremendous effort to catch up from the 4 meetings cancelled by weather. Mobility is mounted and seems to be operational – a systems test with controls on Sun Feb 13 will bring life to our drive system. The four manipulator subgroups have progress to each their own; these groups are the most in-need of assistance! The minibot team has completed promising tests as we await from them a fully-functional unit. As personnel from other subgroups complete their tasks, they are re-tasked to subgroups in need of help. Overall members have assumed responsibilities well and we’re looking forward to keeping the fast-paced productivity happening now!